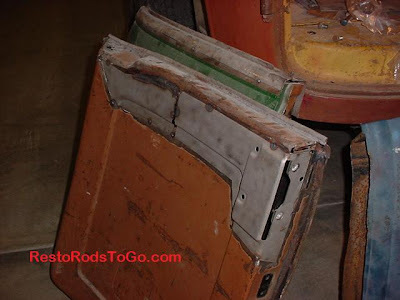 Hot rods are built to many different standards. Some Hot Rods are set to a strict theme, having every little detail dialed in to a specific time period as in the 1950's or 1960's. 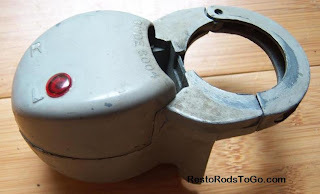 This would be a pure Resto Rod. 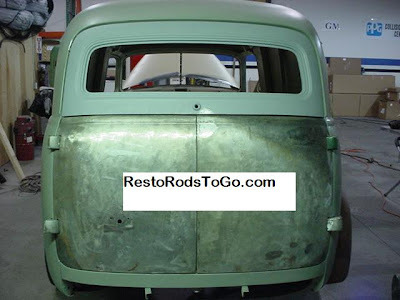 These Resto Rods are timeless, being like a part of history, they don't lose their appeal. 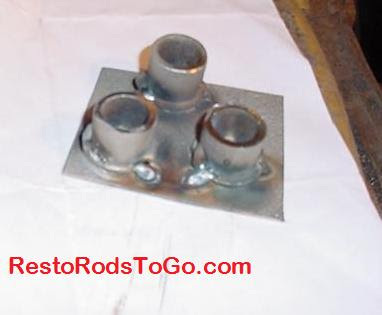 Some hot rods are just put together with whatever is available off the shelf. Some make use of all the latest hoopla parts that are advertised in the magazines. Those modern street rods are sometimes very expensive. Next year, they're obsolete cause there's new stuff out at that point. I just have a hard time with the industrial look of the new gauges, steering wheels, shifters, and especially the wheels that are popular now. I like to use the example of "put some of those 21 inch low profile wheel/tire combinations on a Model T". How's that look? Yes it's an extreme, but the concept is still the same. They just don't work on older cars. Period.... The upholstery almost always doesn't fit the design character of the original car either. Loose the door handles and you've lost another major design component. Chrome bumpers.... On and on. The designers of the 1930's cars especially, were doing their jobs very well, in my opinion. I personally like to take advantage of all of the fabulous design work that coordinates with the theme and the original design of the car. Occasionally, it is possible to improve on original design, but not being a designer myself, or even having any degree in art for that matter, I feel a need to be very careful when it comes to customizing cars. When I do customize cars, I want the changes to be invisible, or look like they haven't been modified at all. If it looks like it hasn't been customized, whether it is a big modification or small, it has been a success! 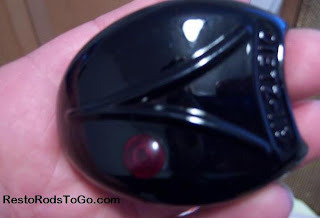 Vintage turn signal switches for classic and vintage cars and trucks are available on the used market in a variety of nice styles. These are quality Made in the USA switches, unlike the new switches you buy from retailers. I have made a hobby of collecting and restoring some of the nicer switches that were produced. 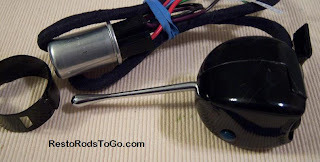 Guide was the manufacturer for General Motors accessory switches and the 6004 model came in two different styles as far as the mounting hardware is concerned. 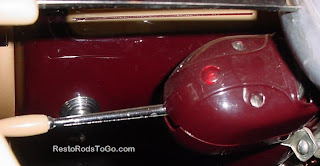 The early switches that were also used on truck through 1953, had a separate clamp while the cars in the early 1950's had the clamp as part of the lower casting. The early switches were wired for separate lights both front and rear. The later 6004 production switches were wired for integrated lights in the rear. Some other companies such as Dietz and BLC also marketed the 6004 guide with slightly different casting and one that was sold through Wards dept store had a different handle, more like the Yankee switch of that era. The Yankee is another very nice die cast switch that I have been fond of. The one that is the rarest though, and gets the most attention on the market is the one that was made by Pioneer, and we refer to that one as the Buck Rodgers switch. 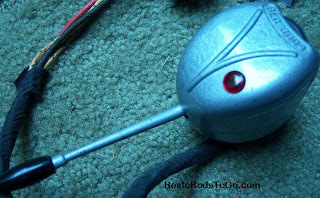 It came in hammer tone finish and rarely in chrome. Please check out the pictures I've posted here. Click on them to enlarge. 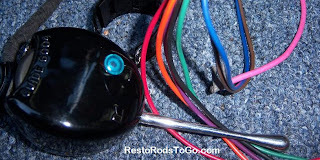 I installed the 1940 Ford Dash in my client's 1936 Ford Cabriolet, and because it is a 1950's theme hot rod, I concealed the stereo system in it. All components are out of view. 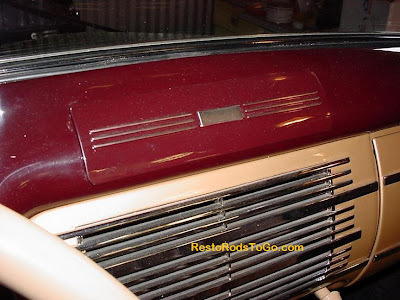 The speakers were mounted in the speaker grill and behind the leather upholstery on the sides in the rear. 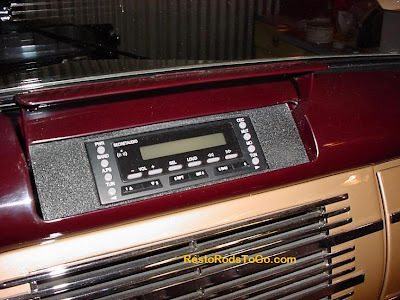 The CD changer is under the seat and the control head is behind the radio delete plate. I had to make a custom hinge system for that. The antenna is one that I made from some coax antenna lead with a 31inch length of wire laid into the wooden top bow. 31 inches is the standard length for FM radio. Everything works great. Headlights have come a long way since automobiles were first built. 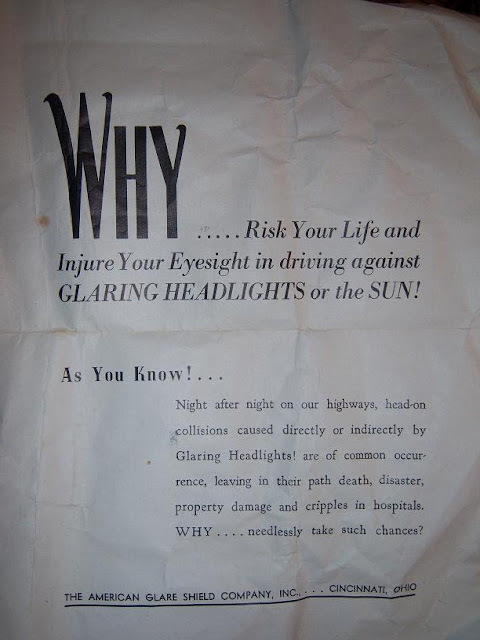 Although they light up the road far better now, than they used to, they were blinding, making night driving quite hazardous. 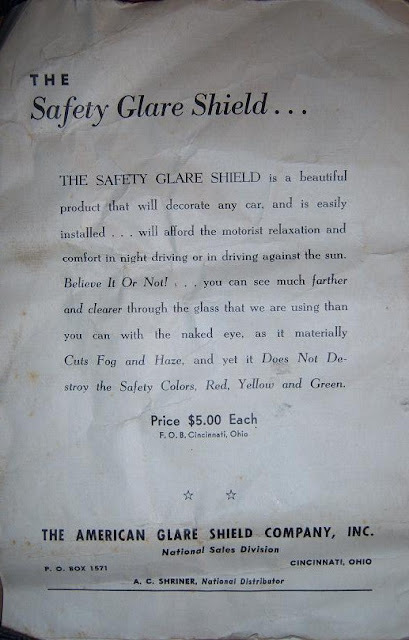 Early headlights did not have the defusing lenses that the new headlights have today. 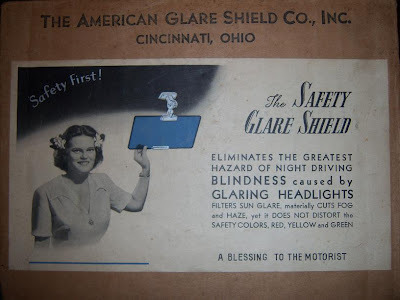 With just clear glass, they were glaring right in the eyes of the drivers of oncoming vehicles. Lens technology was advancing in the later 1920's. Still there were such a range of differences in output that small companies started marketing GLARE SHIELDS. 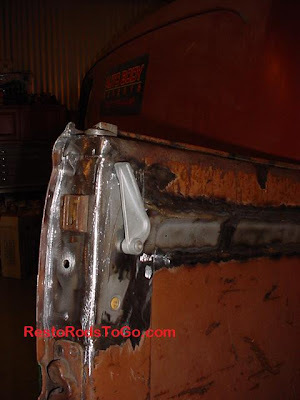 I have come across a couple good examples of those, on e-bay, and actually installed one on my 1937 Chevrolet Pickup. The one I kept, retailed for $5.00 when it was new. That was a substantial amount, considering you could buy a new car for about $500.00 then. The propaganda that was with these examples is quite comical to read. The Anderson Carriage Company, established in Port Huron, Michigan in 1884 was moved to Detroit by its founder in 1885. The first Detroit Electric car was in 1907. The electric car business prospered, and in 1911 the firm was renamed the Anderson Electric Car Company, but the cars were still known as Detroit Electrics. The company was always careful to insist that its cars were not for touring. It was designed as an urban vehicle for the woman driver. The advertised range was 80 miles between charges, however in one company test; a Detroit Electric ran 211.3 miles on a single charge. In 1913, Detroit Electrics were built under the license in Scotland by Arrol-Johnson. In 1919, the company name was changed to Detroit Electric. Production continued until 1938. Sometime before WW11, The most famous American electric car quietly disappeared from the automotive scene. Best of Show HOTROD-A-RAMA 2006 Tacoma Washington. It took me 3 years to complete this car. 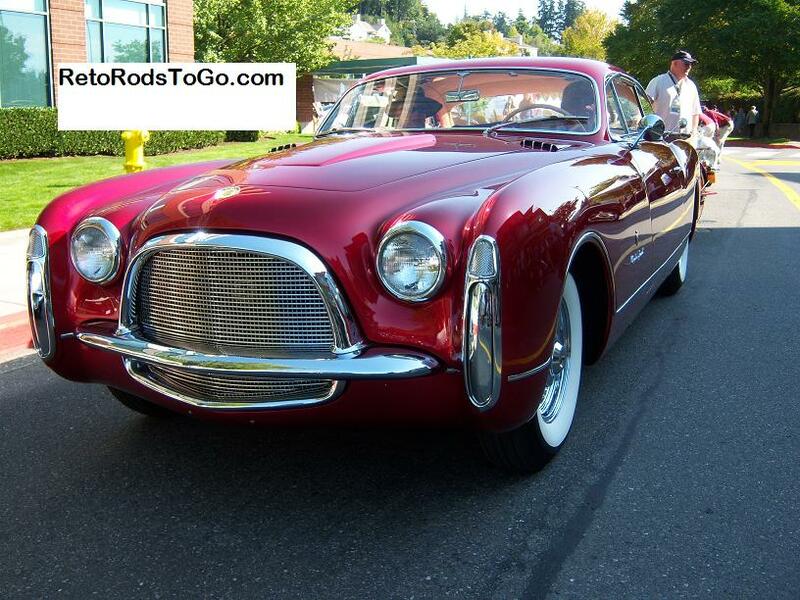 This 1950's period hot rod captured the big trophy at the Hot Rod Show in Tacoma in August 2006. 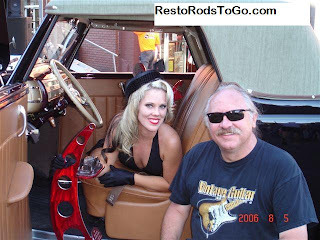 Seen here with the owner of the 1936 Ford Cabriolet and the beautiful lady I hand picked at the show to accent the scene. Doesn't she make that leather look inviting? The beautiful trophy was hand crafted by Sean Harvey. 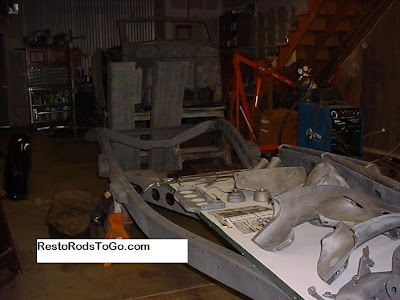 It sports a bronze 32 Ford Roadster on the platform. 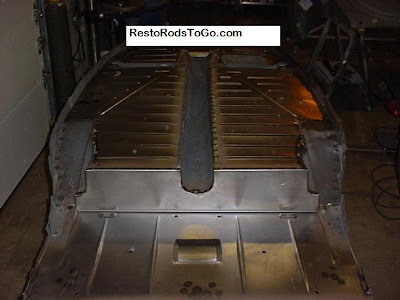 By using only parts that were available in 1958 and prior, we created a hot rod from this 1936 Ford, that is Pure and correct for the 1958 Theme. 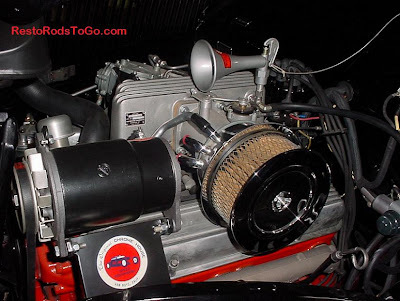 The engine is an August 1957 Corvette FI 283ci. All accessories are date correct to that engine. 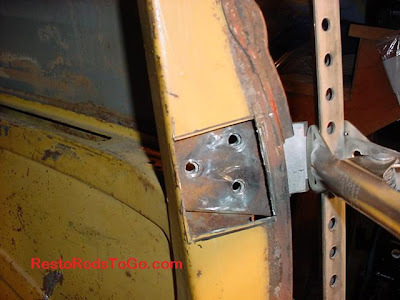 Fittings and fasteners are also correct. Yes the generator is a Corvette generator and the voltage regulator is date/application correct too. The attention to detail on this car is unsurpassed. The top material was saved from 70 years ago. It is correct to the car. The drive train consists of a 39 trans with NOS Zephyr gears. The Columbia two speed rear end makes this car very functional at highway speeds and beyond. The wheels are early 1950's Streemlite trailer wheels. 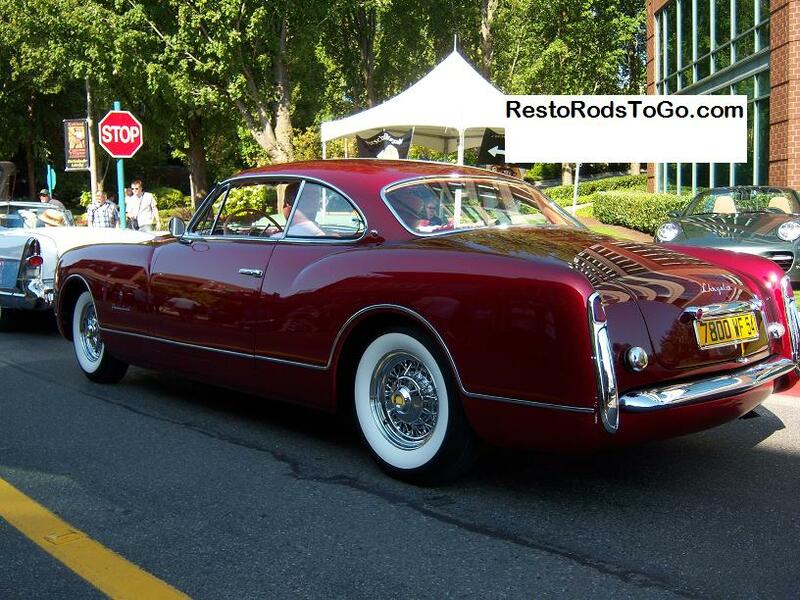 They were originally rough cast wheels but polish up quite nicely for a refined car like this one. 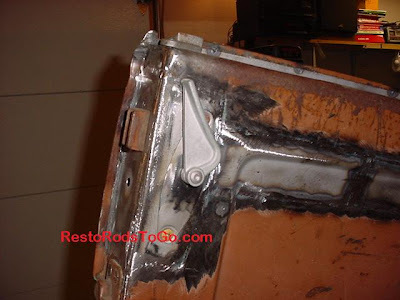 The bolt pattern is correct for Ford. The 1940 Ford dash sports all the original gauges, ash trays, and knobs although the knobs now control all the systems in this car. A lot of modifications in the controls and fabrication was required to attain this. 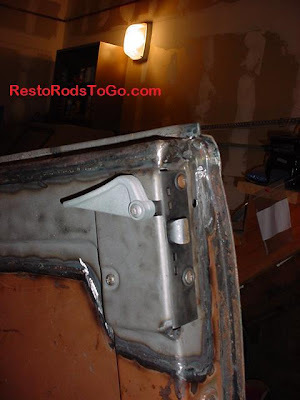 You can see more pictures of this in the Rod & Custom Feature article that can be accessed by clicking on the link to My Featured Restorations on the left side of my page here. 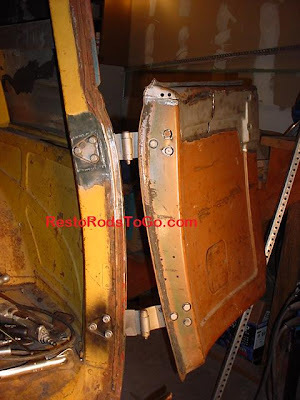 These 1948 Chevrolet Panel Truck Doors were made up from all original Suburban and Panel Truck Door parts. 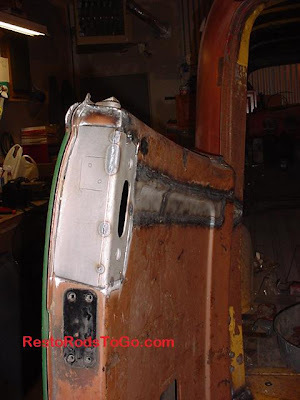 I mounted the upper part of the clam shell Suburban doors and used the upper part of the Lower, or tailgate as well as the lower parts of the original barn doors and almost all the hardware, latches etc. In moving a lot of things by splicing and dicing and making new mounting points for hinges, reconfiguring the release handles and hinges etc., this project was a complete success. By success, I mean that it looks like a factory configuration. The advantage to this configuration is the increased visibility of the large back window, over the two small windows, while still maintaining the ease of access that the original barn doors had. Genuine OEM 1937 Chevrolet Truck Grill Emblem with original paint. 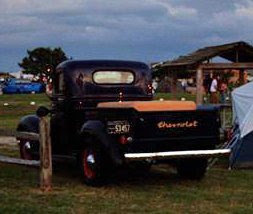 The reproduction grill emblems are designed from the 1937 Chevrolet Car emblems which are daintier in fashion. If you look closely at this original and compare to the repops, you'll notice the more bolder styling on the truck emblem and of course the quality and crispness of detail. 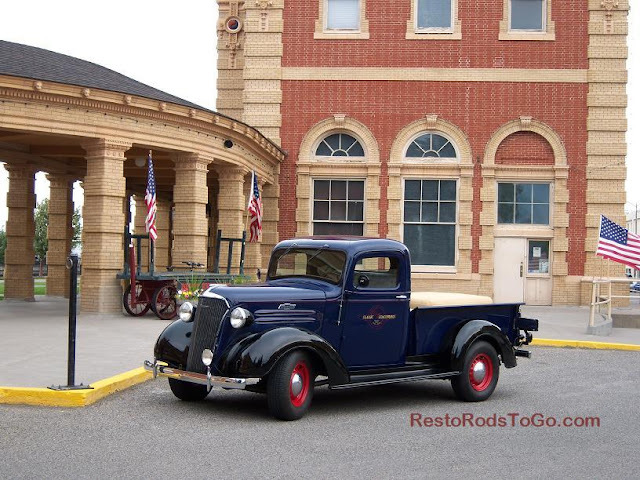 This 1939 Chevrolet Sport Coupe is restored to it's original glory with the exception of taller highway gears and a little larger stove bolt six. We used a 1954, 235 cubic inch inline six, so it still looks quite original under the hood but is capable of maintaining highway speeds. 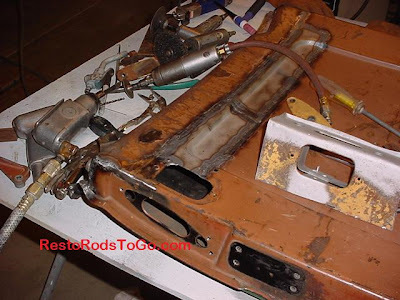 We used all the original accessories on the engine including the old style valve cover. If you are not an expert on these early Chevrolets, you'll not be able to tell it's been upgraded. Maintaining the design appearance is something I strongly lean towards. The paint is a near perfect match to the original Mars Gray. 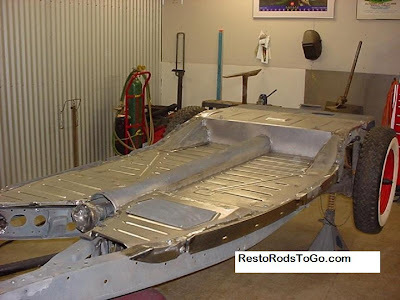 This was accomplished by taking the modern Dupont replacement paint, eliminating the glittery metallic substance in the formula, and replacing it with the dullest aluminum that was available in the mixing bank. The glass is date bugged and black edged just as it was originally. 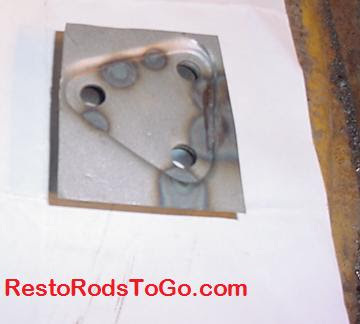 All fasteners are also of correct markings and finish. Detail, detail, detail. The 1953 Chrysler Ghia concept car at the 2009 Kirkland Concours d' Elegance is the one that really caught my eye. 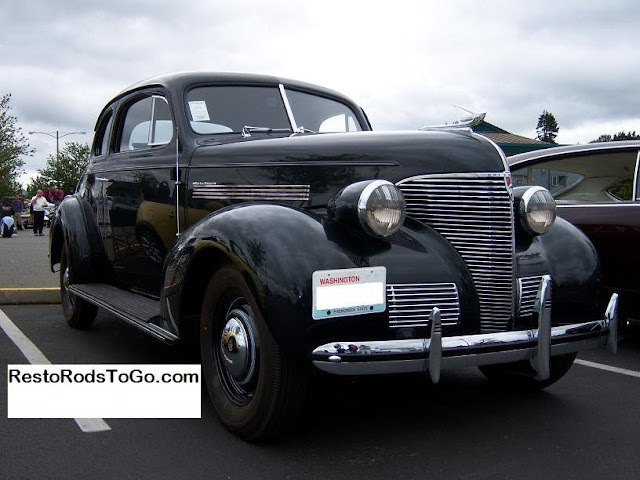 It is interesting to note that a lot of the features of this car have been used in many of the late model Chrysler products. I have always had a strong belief that those early designers were blessed with immense talent. If you look at pretty much all of the 1930's automobiles, you will certainly understand my point. They were designing with their hands and from pictures in there heads. Not with the modern technology available today. I had invited some friends to ride over to see some real classic cars. Because so many people refer to Mustangs and other mass produced vintage cars as Classic Cars, (not that I consider Mustangs as Vintage), I wanted to show friends what real Classic Cars are. I think they caught on to the term Classic Car shortly after they walked into the show area. There were a lot of very nice Classics at the gathering. It was a good show. Check out this Ghia! WOW! As we were checking out the cars at the Billetproof show in Centralia, Washington this last weekend we come across an old Ford with Elvis sitting behind the wheel. I struck up a conversation with him and had my camera rolling to record it. 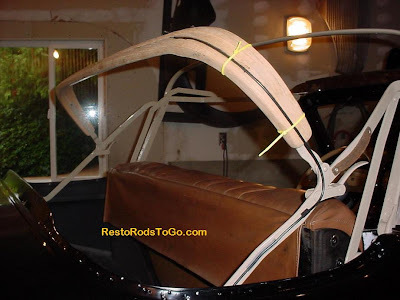 As I made a conscious effort to land employment in the shops with the highest reputations, I was privileged to work with many talented automotive craftsmen over the years. As a result of their mentoring, my career evolved into the restoration of some of the finest exotic and classic cars in the world. 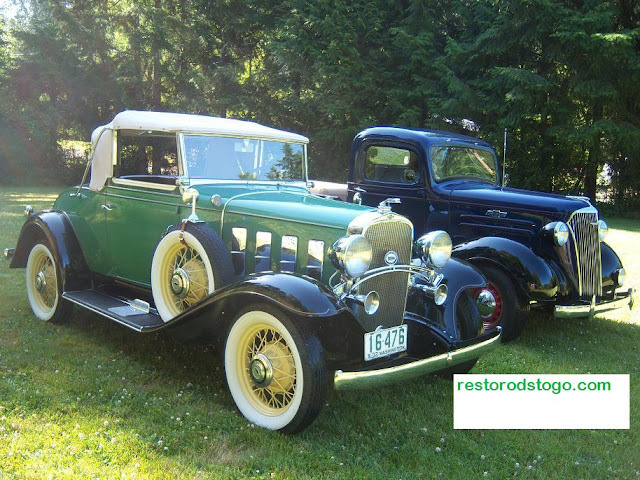 Packards, Cadillacs, Isotta Fraschini, Bentley, Rolls Royce, and Ferarri, just to name a few of the fine automobiles I had the pleasure to restore. Complete reconstruction of wooden-bodied cars such as the 1929 Murfy-bodied Duesenberg convertible sedan, and smaller cars like Chevrolet Cabriolets gave "body building" a whole new meaning. 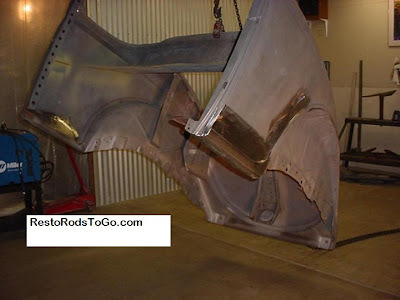 Understanding why the "all metal Fords" have been favored by the thrifty car collectors, and hot rodders becomes very clear when you have the experience of building inside the sheet metal skin of one of these "wooden-bodied cars". 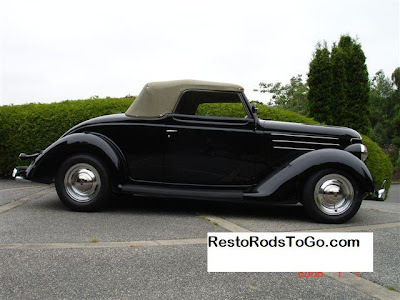 In comparison, the major reconstruction of all metal-bodied cars including the 1936 Ford Cabriolets proved to be a far easier task. 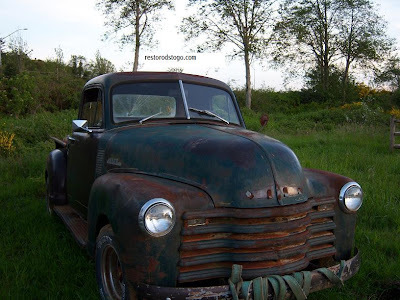 However, by doing both I acquired the expertise to specialize in the 1930's era of motor vehicles, as well as the ability to restore any vintage car or truck. As a result of my life experiences, I've acquired a taste for vintage style hot rods. I find great pleasure in building cars in pure form, respecting and retaining the great design work in these early cars while producing something that is "drivable". Selecting a "theme" and maintaining that focus throughout a project proves to be a serious challenge, but provides great satisfaction to my clientele when the project reaches completion. That's what Doug's Classic Coachworks is all about!